OLFA Knife Heavy Duty L-5 Model 1116110 18mm. The OLFA® L-5 Fiberglass-Reinforced Heavy-Duty Ratchet-Lock Utility Knife with Multi-Pick lets you work with confidence. The rugged stainless steel blade channel extends the full length of the handle to support heavy-duty cutting. The ratchet-lock blade slider allows for quick and easy one-touch blade extension into unlimited cutting positions. This knife includes a multi-purpose metal pick for all of those tasks where you shouldn’t use your blade tip. It is perfect for opening paint cans, removing plate covers, cleaning out caulk, and more. Plus the handle is chemically resistant to paint and MRO environments. Pre-loaded with an 18mm LBB Ultra-Sharp Black Snap-Off Blade, use this utility knife for any heavy-duty construction applications such as drywall, roofing, flooring, rubber, linoleum, gasket materials, and more. Uses replacement blades LB, LBB, LH, L-SOL and SWB. Warranty: OLFA Handles Are Guaranteed Forever. OLFA Blades LB-5B Model 1092625 18mm Are Heavy Duty Snap-off Replacement Blades. 5 blades per pack. CLICK ON IMAGE AND SCROLL DOWN TO RELATED PRODUCTS FOR A LIST OF CUTTERS OR KNIVES THESE BLADES WILL FIT. OLFA Blades LB-10B Model 5009 18mm Are Heavy Duty Snap-off Replacement Blades. 10 blades per pack. CLICK ON IMAGE AND SCROLL DOWN TO RELATED PRODUCTS FOR A LIST OF CUTTERS OR KNIVES THESE BLADES WILL FIT. OLFA Blades LB-50B Model 5016 18mm Are Heavy Duty Snap-off Replacement Blades. 50 blades per pack. CLICK ON IMAGE AND SCROLL DOWN TO RELATED PRODUCTS FOR A LIST OF CUTTERS OR KNIVES THESE BLADES WILL FIT. OLFA Blades UltraMax LBB-5B Model 1072195 18mm Are Heavy Duty Snap-off Replacement Blades. 5 blades per pack. CLICK ON IMAGE AND SCROLL DOWN TO RELATED PRODUCTS FOR A LIST OF CUTTERS OR KNIVES THESE BLADES WILL FIT. 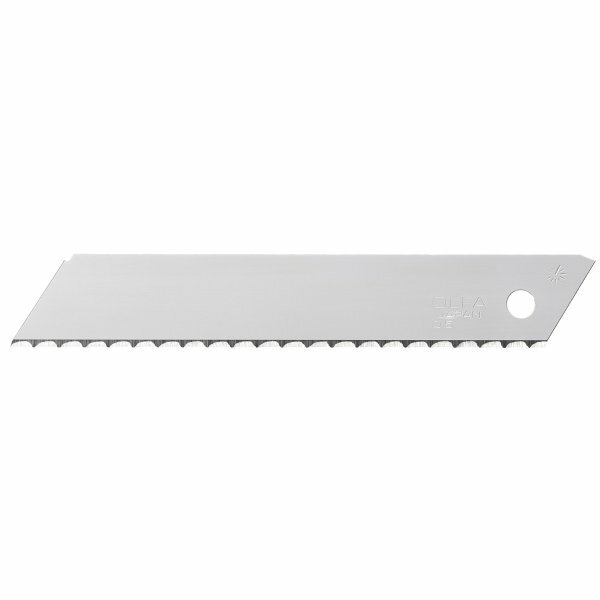 OLFA Blades UltraMax LBB-10B Model 9070 18mm Are Heavy Duty Snap-off Replacement Blades. 10 blades per pack. CLICK ON IMAGE AND SCROLL DOWN TO RELATED PRODUCTS FOR A LIST OF CUTTERS OR KNIVES THESE BLADES WILL FIT. OLFA Blades UltraMax LBB-50B Model 9069 18mm Are Heavy Duty Snap-off Replacement Blades. 50 blades per pack. CLICK ON IMAGE AND SCROLL DOWN TO RELATED PRODUCTS FOR A LIST OF CUTTERS OR KNIVES THESE BLADES WILL FIT. OLFA Blades LFB-10B Model 1120896 18mm Speed Blades For Cutting Jobs That Require Super Speed. CLICK ON IMAGE AND SCROLL DOWN TO RELATED PRODUCTS FOR A LIST OF REPLACEMENT BLADES. OLFA Blades L-SOL-10B Model 9009 18mm Are Heavy Duty Solid Replacement Blades. 10 per pack. CLICK ON IMAGE AND SCROLL DOWN TO RELATED PRODUCTS FOR A LIST OF CUTTERS OR KNIVES THESE BLADES WILL FIT. OLFA Blades LWB-3B 18mm Insulation Blades. For Cutting Porous or Slipper Materials. These Carbon Tool Steel Blades Have a Serrated Blade Edge.